The days blurred together in the camp for the Luckbringer of Tymora. He had seen several men pass from their injuries as well as men not completely healed returned to the lines. All this wore on his soul and battered his mind. The push and shove with the Flaming Fist healers was proving to be more of a challenge than he had expected. The resolve of the young Ilmatari had proven to be stronger than he had hoped. Solomon spent most of his day allocating supplies to the healers in the camp. Making the decisions as to what goes where and is used by whom. Choices that lingered in his mind, and with the loss of a soldier, weighed heavy in his heart. With sedatives temporarily running low, Fulgruun had given the order that only the officers were to receive them. This infuriated Solomon. A great number of the soldiers were young in years. Their screams of pain and cries for relief haunted his thoughts and dreams. Father Drenin had witnessed Solomon giving those restricted medicines to the soldiers and reported it to Sir Fulgruun several times. The Commander of the camp had given him his final warning. If his words were ignored just one more time, the Luckbringer would be facing charges. The grizzled Commander had promised Solomon that his name would be worth nothing once the trials were over. To disobey a commander during times of war was a heavy charge to have levied upon you. Solomon knew this. Broken of mind and spirit, the Luckbringer pushed on. Becoming less of himself and more of a cog in a war machine. His supplies of Wyvern Whiskey were running low. His consumption of it doubling over the days of the shortage. A return to the Gate was in order. Just a respite to regain supplies and himself. He would travel upon a prayer south to the Gate. Perhaps seeing his friends would resurrect his former self. Reignite that spark that had been snuffed out by the machinations of war. With the coming of spring, Greenest comes alive with bustle. Farmers tend to their implements of planting, trappers freshen their tools of trade and hunters sharpen their broad-heads in preparation of the spring hunts. With the expansion of the hamlet, trade has took an upswing. More coin flows through the fingers of the community, even more now with the imports brought by The Rocky Creek Trade Company. The resident Luckbringer takes this new excitement to bestow his thanks upon the village that he calls home by offering blessings to all around. Laying blessings of luck upon trap and axe, plow and wagon, home and hearth. He does so with a broad smile and words of encouragement of growth. He makes a special stop at the new home of the lumberjack that came with the refugees from Tymount. He places an order with him to find a tree, stout and true. He tells him it mustn't be any tree, but one worthy of a shrine to Lady Luck. One perfect enough to receive blessings given and to withstand the testament of both weather and time. An oak or sycamore, perhaps. He tells the woodsmen to scout a few that would be worthy and then present them to him so that he might commune with Tymora under the boughs of the trees. Hopefully to hear her blessing. Solomon helps in preparing the wagons to set forth from Greenest to Berdusk and Irieabor. Seeing that they are properly repaired and ready for the long journey. Half of his employees would be upon the road soon enough. Taking goods from the farming community to distant cities for sale and trade. Returning with commodities needed by those residing within the village. Only two wagons would be leaving, traveling together until Berdusk is reached. Then one continuing on to Irieabor. The remaining ten men and two wagons would stay behind. Ordered by Jackard and Solomon to assist the village in preparing for the planting season. Sharpening tools and cleaning grain bins. Moving livestock from barn to field, making sure they are fed and cared for. Any assistance asked for is met with a smile and nod. Some getting help right away, other with a promise of help in the coming days. Most evenings the men of Rocky Creek can be found within the Inn, pouring ale and sharing stories over a meal. Joining in games of chance and finding happiness in the laughter shared. Greenest has become more of a home to the Company than they had ever imagined. A sense of teamwork and togetherness was easy to see by any looking on from afar. 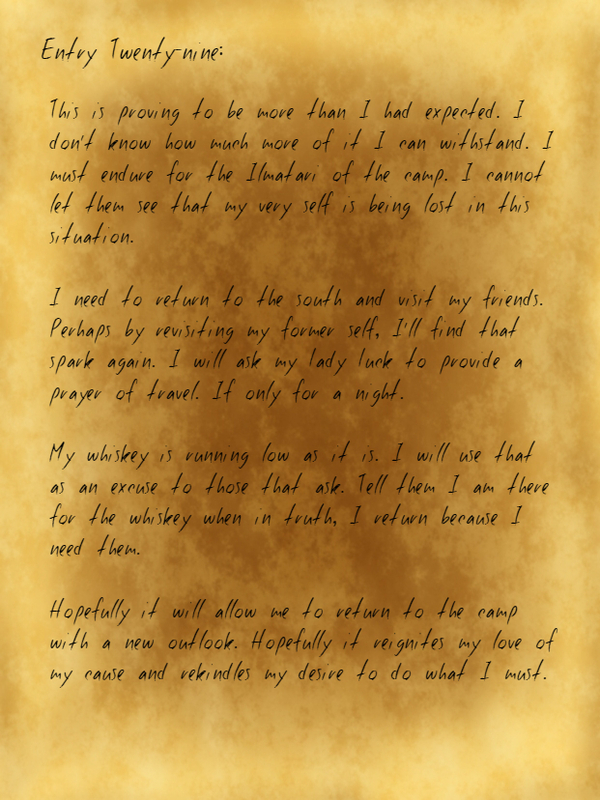 Having spent several days within the city of Berdusk, Solomon finds himself at the Running Stag Inn. There he would spend a few evenings spinning yarns with the patrons. Telling tales of his adventures on the Sword Coast and those he had met in his journeys over endless tankards of ale and numerous meals. Always speaking of his friend and partner, Jackard. Telling those that would listen of their seaward journey from Tethyr to Baldur's Gate. 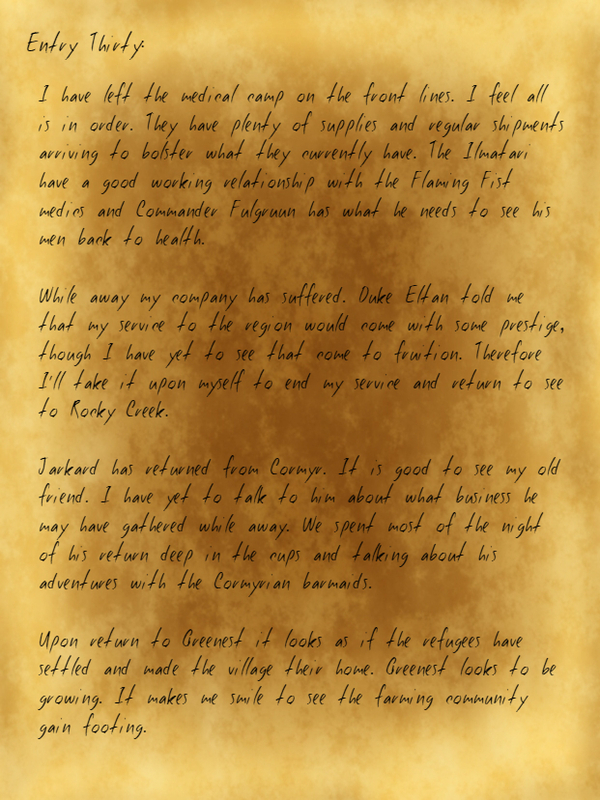 Their brief stay in the town of Soubar and their finding of the hamlet of Greenest. He would tell them of the founding of Rocky Creek Trade Company and what they sought to accomplish with the merchant company, and who they wished to help with their wealth once gained. Recounting stories of The Order of the Radiant Heart. Grand Knight Gaven Arkalis and his faithful knights. The ceremony he was honored to witness of the knighting of Lady Marianne Cain. 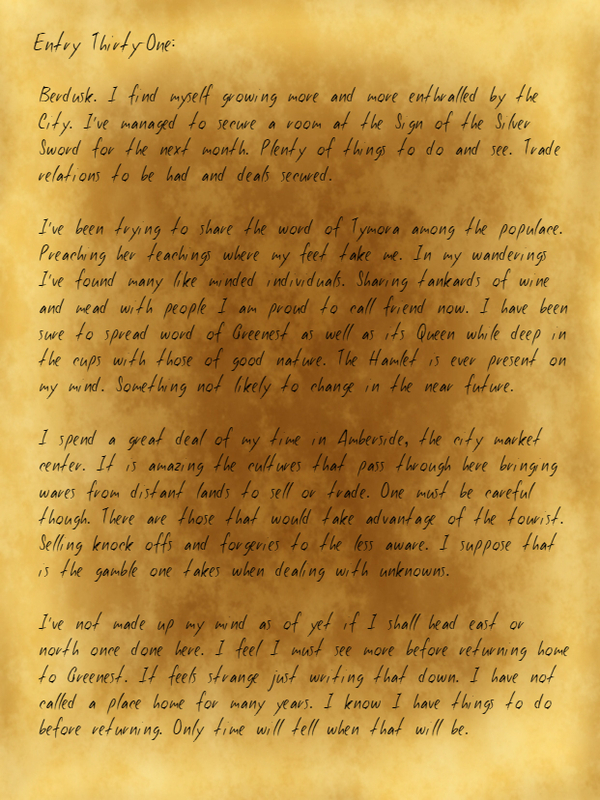 He spoke of Kruegar and of his loyalty, always offering to help in any way that was asked. Sir Aaron Lyonaler and his honor, using his strength and skilled tactical mind to defend those of the Coast. He would tell them the story of how the company had come to the aid of Greenest, sheltering the village from an undead onslaught. Where the Luckbringer had first met most of them, earning his respect in their actions. Providing them with tales of The Northern Watch led by Commander Di'Corvi. How the brave souls of the Watch would position themselves between the evils of the north and the good citizens of Baldur's Gate with little to no pay and never asking for recognition for their deeds. How they too helped to defend Greenest in its time of need. Helping to defend the little hamlet from encroaching shadow. Solomon would speak of Tymount and the archer Suul. How together they stood at the wall as devils decended upon them and how this archer stood defiant, raining arrows upon them. Saving Solomon's life in the process with quick healing and action. Excitedly he spoke of the Druidess of Greenest, Iolana and her protector Aiden Vega. Of how they had shared a spiritual experience beneath a golden tree upon the cliff side of The Cloud Peaks mountain range. He told them of how this couple had sworn to protect Greenest from all that would move to harm it and the friendship the Luckbringer had found in them both. His voice telling of how he missed them. Reveling in these tales of times past, Solomon would get to know several of the patrons of the Running Stag as they in turn learned of his life and things he held important. The conversations would make the Luckbringer homesick, the stories told with a longing in the words.